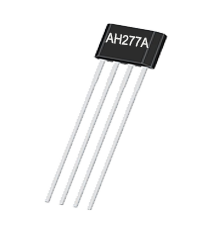 The AH277A is an integrated Hall sensor with output driver designed for electronic commutation of brush-less DC motor applications. The device includes an on-chip Hall voltage, a Schmitt trigger to provide switching hysteresis for noise rejection, a temperature compensation circuit to compensate the temperature drift of Hall sensitivity and two complementary open-collector drivers for sinking large load current.It also includes an internal band-gap regulator which is used to provide bias voltage for internal circuits. Placing the device in a variable magnetic field, if the magnetic flux density is larger than threshold BOP, the pin DO will be turned low (on) and pin DOB will be turned high (off). This output state is held until the magnetic flux density reverses and falls below BRP, then causes DO to be turned high (off) and DOB turned low(on). AH277A is available in TO-94(SIP-4L) package.